Jupiter is the largest planet in our solar system. This gargantuan object dwarfs the earth—indeed, over 1,300 Earth-sized objects could fit inside Jupiter. And its mass is 2.5 times that of all the other planets combined. Where did this beautiful planet come from? The Bible tells us that Jupiter, along with other heavenly objects, was created on Day 4 of Creation Week (Genesis 1:14–19). However, evolutionary astronomers deny the biblical account. 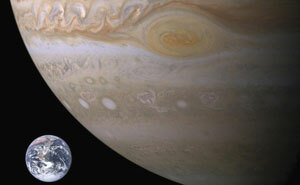 They claim that Jupiter formed by natural processes about 4.6 billion years ago. Unfortunately for them, Jupiter poses enormous problems for those wishing to deny the creation of our solar system. Unlike Earth, which is mostly rock, Jupiter is mostly gas. It might have a small rocky core deep inside—we don’t know for sure. Jupiter is about five times as far from the sun as Earth is. Because of this vast distance, Jupiter appears in our nighttime sky as a bright white star. However, thanks to its massive size, even a modest telescope will reveal that it isn’t a star, but a planet—it looks like a disk, while stars look like points of light. 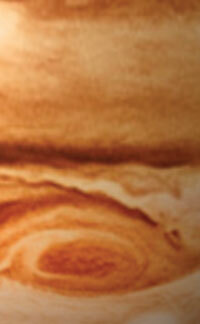 Jupiter’s most famous feature is probably its Great Red Spot. This is an enormous, violent storm system—it’s even larger than Earth! This storm has been raging continuously for at least 300 years. For all we know, it might have been in place since the planet’s creation. Jupiter is more than just a beautiful object in the sky. Its very existence also poses an enormous challenge for those who want to believe in an evolutionary origin of our universe. Jupiter and Earth shown to scale. According to the evolutionists, the rocky planets like Venus and Earth formed as these large rocks collected together. The gas giants like Jupiter and Saturn formed initially in the same way. But in contrast to the inner planets, the embryonic giant planets were far enough from the sun for ice to condense. Therefore extra mass could accumulate—over 10 times as much material as the entire earth contains today. With the help of the ice, this accumulation had so much gravity that gas was pulled onto them, eventually forming the gas planets which we see today. Since the collection of rocky chunks became the cores of the gas planets, this idea is called the ‘core accretion’ model. This story is still being told today on television, in books and magazines, in science videos, and so on. However, scientists have known for a long time that this model isn’t true. The core accretion model has at least four fatal problems. A storm on Jupiter has been raging continuously for at least 300 years. Problem 3. The model requires at least 10 million years for enough rocks and gas to accumulate to form Jupiter. Some scientists say it would take even longer—several hundred million years at least. But scientists also acknowledge that a disk of dust and gas wouldn’t have lasted around our sun for that long. Many scientists believe that such a disk would have dissipated in less than 5 million years—leaving no time for Jupiter to form. Problem 4. Even if the gas/dust disk lasted long enough, we still wouldn’t get a Jupiter from it. Recent computer simulations have revealed a devastating problem with the core accretion model. As gas giants formed within the disk, they would have interacted gravitationally with the dust remaining in the disk. It turns out that these interactions would pull the developing planets inward, towards the sun. So both Jupiter and Saturn would have swirled inwards until they slammed into the sun. And this would occur ‘quickly’ in evolutionary terms: only 300,000 years after they started to form. Jupiter is a wonderful illustration of an important principle in science. When you reject the truth, you have to accept a lie. Evolutionists have already rejected the biblical account of Creation. Therefore, they have to accept the ‘best’ evolutionary alternative. Even though their model has been denied by multiple lines of evidence, it ‘must’ be true. Yet evolutionists still cling to this model, despite the overwhelming evidence against it. They’re unwilling to accept the truth that Jupiter illustrates about its Creator. Pity the poor evolutionist who is so committed to a bankrupt theory that he cannot see his own Creator’s handiwork in this majestic planet. 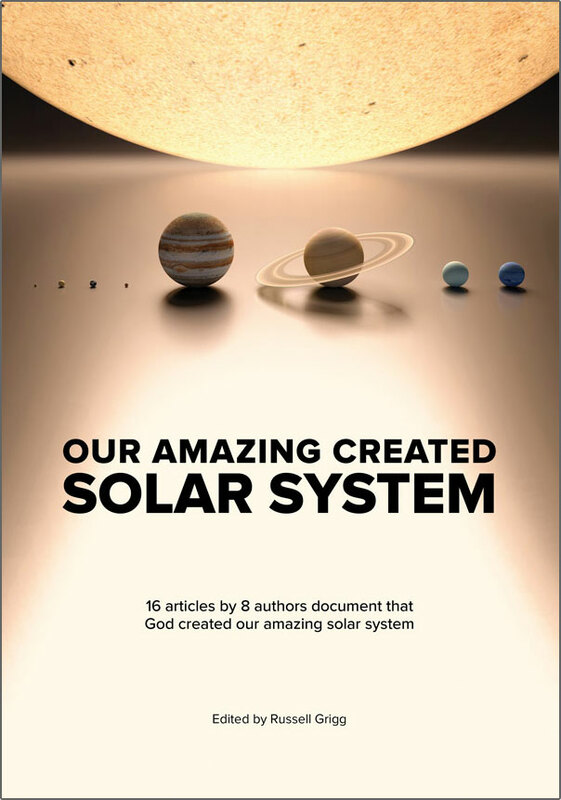 Truly, Jupiter’s size, beauty, and grandeur are a wonderful testament to our Creator—the God of the Bible, who not only made the stars and planets (for our benefit—Genesis 1:14–19), but also us! * ‘The Solar System, Jupiter’, The New Encyclopædia Britannica 27:561, 1992; Jupiter, Wikipedia, <en.wikipedia.org/wiki/Jupiter>, 7 February 2008; Jupiter Fact Sheet, NASA, 7 February 2008. See also Sarfati, J., Earth is ‘too special’? Creation 28(3):42–44, 2006; <creation.com/earthspecial>. Return to text. According to the evolutionary model, these elements could only be present in such concentrations if Jupiter had formed further out in the solar system—at more than 10 times Jupiter’s current distance from the sun. Some have suggested that maybe Jupiter formed at that distance, and then moved inwards later. However, this doesn’t solve the problem. There wouldn’t have been enough material at that distance for Jupiter to form. Also, Jupiter doesn’t contain the heavy elements that it would have, if it had actually formed way out there. Return to text. Ball. P., Giant mistake, Nature science update, 18 November 1999, <www.nature.com/news/1999/991118/full/news991118-10.html>. Return to text. See comments from Alan Boss and Hal Levison in Mullen, L., Birth of a giant: how did Jupiter get so big?, 17 May 2001, <www.space.com/scienceastronomy/solarsystem/jupiter_origins_010517-3.html>. Return to text. Recent attempts to solve the migration problem have only made matters worse. One suggested answer is that Jupiter is only the last of a series of gas giant planets, each of which did migrate inwards into the sun. 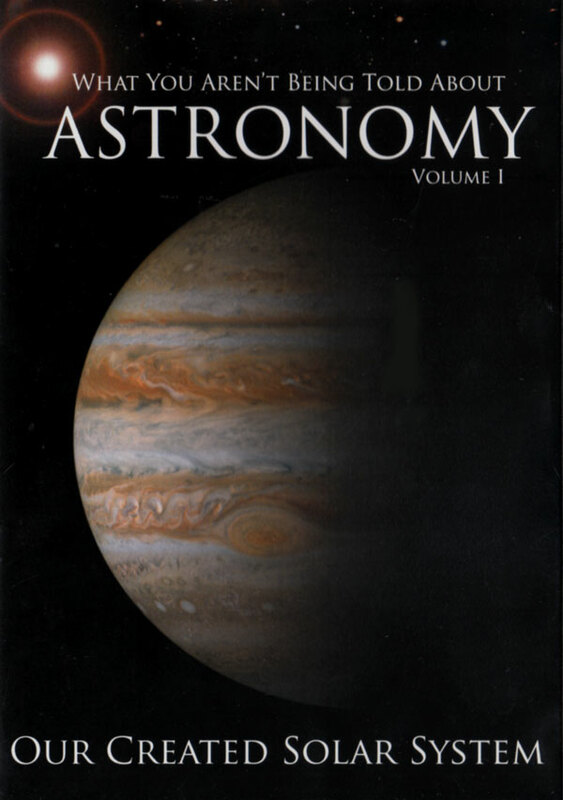 Jupiter was merely the last one in the series, which happened to form right as the gas/dust disk was dissipating. Even many evolutionists are bothered by the obviously ad hoc nature of this fable—there’s no evidence for it, and its only purpose is to rescue evolution from the facts. Plus, Jupiter couldn’t have formed from a disk that was depleted by previous generations of gas giant formation. So this suggested solution solves nothing. Another suggestion is the new ‘disk instability’ model, which proposes that the gas/dust disk collapsed quickly into planets, before migration could occur. This model has a long list of fatal problems: Uranus and Neptune don’t match its predictions, the comets and other trans-Neptunian objects don’t match its predictions, and the model’s proponents have yet to demonstrate that rapid disk collapse is even possible anyway. Return to text. Wetherill, G.W., How special is Jupiter? 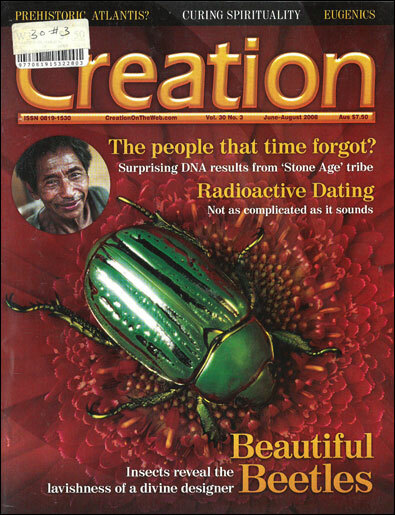 Nature 373(6514):470, 9 February 1995. Return to text. Wetherill, G.W., The Formation and Evolution of Planetary Systems, Cambridge University, p. 27, 1989, as quoted in Stuart Ross Taylor, Solar System Evolution: A New Perspective, Cambridge University Press, Cambridge, UK, p. 205, 2001. Return to text. Scott Tremaine, as quoted by Kerr, R.A., Jupiters like our own await planet hunters, Science 295(5555):605, 25 January 2002. Return to text. Harold Levison of the Southwest Research Institute as quoted in Solar system makeover: wild new theory for building planets, <www.space.com/scienceastronomy/solarsystem/planet_formation_020709-2.html>, 9 November 2007. Return to text.